Transport engineers like to focus on mobility, which characterizes the movement of people or goods. It is a means to an end, in which mobility is required for a person to perform an activity that takes place somewhere else. On the other hand, land use planners like to focus on accessibility. This has several definitions, but in the context of urban design, it defines the ease at which activities can be performed. The ability to perform activities within a neighborhood (accessibility), is fundamental to urban design. How can residents in a neighborhood perform their daily tasks as easily as possible, without the need to travel long distances and without the need for motorized transport? This is achieved using various ways, among them, higher density developments, narrower streets and more pedestrian access. The solutions are up to the planners, but they often hint towards some kind of compactness in the neighborhood structure that shortens trips and allows activities to be brought closer together. The infrastructure within the neighborhood has to support that. While Link will bring mobility to surface segments (i.e. 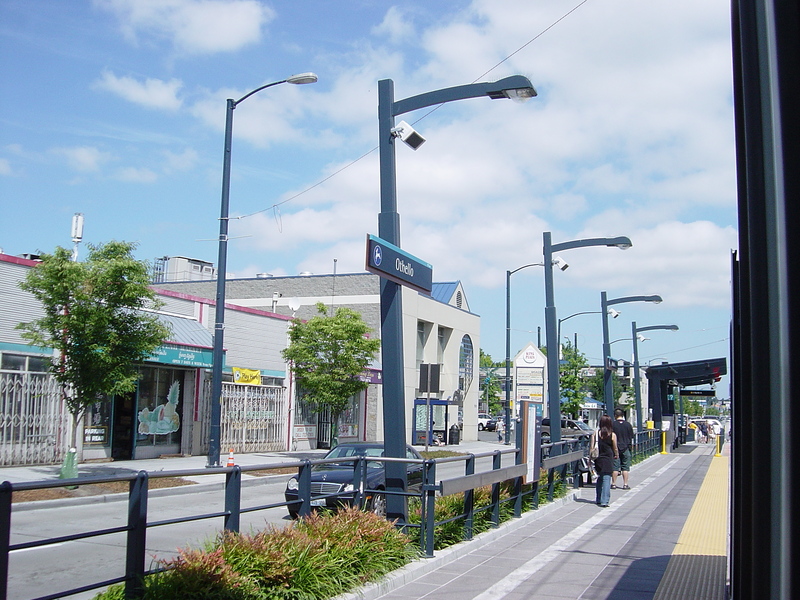 Rainier Valley) as well as some Transit-Oriented Development, its design places a limit on accessibility when it runs on the surface. It can take people farther away from the neighborhood, and it can generate development around the station, but it doesn’t allow trips to be as compact as possible within the neighborhood. This is notable in surface running applications such as on MLK. One of the touted capabilities of our light rail system is its capacity, not because of its frequency, but because of its ability to run 4-car trains. This is necessary to support demand elsewhere in the network, but not necessarily in the Rainier Valley. In grade-separated operations, the ability to run 4-car trains is a plus. However, on surface streets such as MLK or the planned Bel-Red corridor, this may become an issue for accessibility. A 4-car train totals just over 380 feet (116 m) and the surface stations (such as those on MLK) built to support them meet or exceed 600 feet when ramps and access points are taken into account.Our light rail stations surpass the length of a typical downtown Seattle block length and conflict with components of accessibility. These stations are fenced off on both sides, and prevents access from any point other than the ends of the blocks they sit on. The infrastructure needed to accommodate the train’s sheer size represents a large barrier in the middle of MLK and enforces the distance residents must travel to get to “the other side”. The train itself may be accessible, but a trip starting from mid-block and ending on the opposing mid-block is separated by more than 600 feet, even though it is physically not more than 100. It removes connections across MLK, connections that will become even more important when TOD is built around the stations. And then there is the long distances between intersections. Between S Orcas St and S Graham St, there is only one pedestrian crossing over a span of nearly 2000 feet. These compromises are the direct result of Link’s attempt to serve both the region (through a 60-mile corridor) and urban neighborhoods (street running). It needs the reliability provided by uninterrupted movement through the corridor, but on street-level, that requires minimal intersections and pedestrian crossings. It needs the long platforms that can handle 4-car trains to meet demands elsewhere in the network, but occupies large footprints in what is to become the center of TOD. Where Link strives to provide mobility for the region, it does so at the expense of neighborhood accessibility. If surface rail is aimed at complementing mobility, it should be scaled to support it. But in this case, Link is scaled for the need to provide mobility out of the neighborhood, rather than complementing the neighborhood in which it operates. So what exactly are we building? This is a question we need to answer, even if it may already be too late. Are we building a light rail system that satisfies the mobility needs of Seattle and its immediate suburbs? If so, our sizable trains that try to meet regional needs may negate the accessibility benefits when it runs on the surface. It also doesn’t serve enough of Seattle to satisfy urban mobility needs and instead, ventures out into the suburbs with a stop every 2 miles. Does that mean we are building a regional network to connect cities in the Puget Sound region quickly and reliably? That too is questionable, because in that case, we are pushing the very concept of light rail beyond its intended use, where it may not keep up with the performance demands of regional services. Urban mobility and regional connections are two completely different concepts that each require their unique solutions. Urban mobility is provided by an urban or suburban network with high capacity, frequency and accessibility to facilitate short trips within an urban area. Regional mobility is provided by high-performance trains that can travel between multiple cities quickly and reliably. These two concepts conflict in many different ways. Unfortunately, it appears that we are trying to serve urban, suburban and regional needs with one mode, and in the end we may get something that serves none of them particularly well.